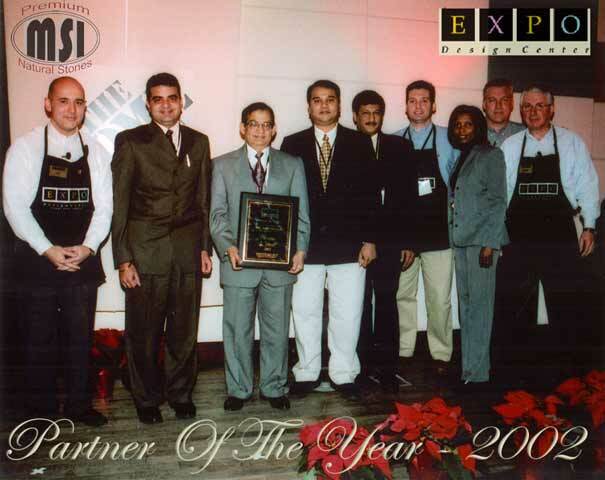 Manu Shah, CEO, and a team from M S International, Inc. accept the partner of the year awarded from Expo Design Center at a ceremony in Atlanta. M S International, Inc. ("MSI"), a leading North American distributor of natural stone, today announced that it has been awarded Partner of the Year for 2002 by Expo Design Center (a Home Depot Company). The award, presented by Bob Wittman, President of Expo Design Centers, recognizes the outstanding role provided by MSI for their hard work and dedication to service, and as a leading supplier of flooring products to Expo Design Centers nationwide. Manu Shah, CEO of MSI said, "MSI is proud to be recognized by Expo Design Centers as Partner of the Year. This award exemplifies not only the breadth of our product line and distribution capabilities, but also our timely delivery and highest order fill rate with the organization's dedication to providing superior customer service. We continue to look forward to supplying Expo Design Centers in 2003." Manu Shah accepted the award in December 2002, at a ceremony at Expo Design Centers Atlanta, GA headquarters. MSI was the only Company to receive the award for the Stone, Wood, and Tile Flooring category. This award marked the first time a supplier of natural stone received the award. M S International, Inc., founded in 1975, is a leading distributor of natural stone in North America. Headquartered in Anaheim, MSI also maintains branches in New Jersey, Atlanta, Chicago, India, and Mexico City. MSI's product line includes granite, slate, marble, travertine, sandstone, limestone and other natural stone products imported from over 35 countries on Six continents. The company has approximately 130 employees who service a nationwide customer base, which includes leading retailers, wholesalers, fabricators, and contractors of natural stone. More information on MSI can be found on the web at www.msisurfaces.com. EXPO Design Centers, a Home Depot company, sell products and services primarily for the home furnishings industry. EXPO Design Center stores offer interior design products, such as kitchen and bathroom cabinetry, tile, flooring and lighting fixtures and installation services. Currently, there are 53 EXPO Design Center stores in the United States.